A federal indictment accuses former CIA officer Jeffrey Sterling of giving classified information to New York Times reporter James Risen -- about a CIA operation that provided flawed nuclear weapon blueprints to Iran in 2000. The charges in that indictment are unproven, and a trial is set for January 2015. But no one disputes that Sterling told Senate Intelligence Committee staffers about that CIA action, which was dubbed Operation Merlin. As Risen documented in his book State of War, Operation Merlin was ill-conceived and dangerous. Follow daily coverage of the trial at ExposeFacts.org. >> Marcy Wheeler, ExposeFacts: "The Leaky CIA's Case Against Alleged Leaker"
>> Norman Solomon, Marcy Wheeler, The Nation: "The Government War Against Reporter James Risen"
>> Marcy Wheeler, ExposeFacts: "The Government’s Single-Source Theory of Journalism"
>> Matt Apuzzo, The New York Times, "CIA Leaked Classified Information to Support Program"
>> Marcy Wheeler, ExposeFacts: "A Tale of Two Alleged Iran Nuke Leakers"
>> Marcy Wheeler, ExposeFacts: "Grassley Questions Why DOD IG Cannot Report on Leaks"
In the name of countering nuclear proliferation, the CIA risked promoting it. The prosecution of Sterling smacks of selective prosecution. General James Cartwright, who reportedly leaked information on far more recent and sensitive counter-proliferation efforts against Iran, has not faced prosecution. And the Defense Department’s top officials cannot even be identified as leakers by that agency’s Inspector General reports, which apparently protected the former CIA Director and Defense Secretary Leon Panetta from scrutiny for leaking classified information about the raid on Osama bin Laden. 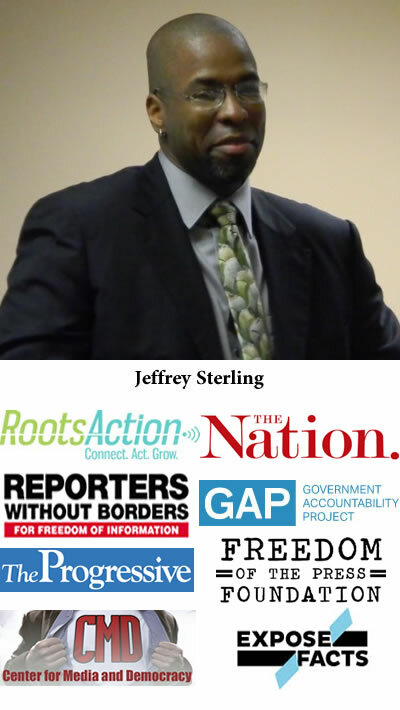 Please sign this petition urging the U.S. Department of Justice to drop all charges against Jeffrey Sterling. As a whistleblower, former CIA officer Jeffrey Sterling went through channels to inform staffers of the Senate Intelligence Committee about the ill-conceived and dangerous CIA action known as Operation Merlin. The current effort to prosecute Mr. Sterling, for allegedly providing information about Operation Merlin to journalist James Risen, comes 15 years after that CIA operation took place. This prosecution serves no valid purpose. Moreover, this is a case that smacks of selective prosecution. Top officials, including General James Cartwright and the former CIA Director and Defense Secretary Leon Panetta, reportedly leaked classified information on far more recent and sensitive matters. We urge you to drop all charges against Mr. Sterling. Please add any comment you like. 56654 1 year ago Ruth Bauer Neustadter Hackensack, NJ , US We need whistle blowers as part of whatever democracy we have left. 56640 2.4 years ago Ryan Reid Olympia, WA , US OMG WTF GROOOOOOOPSTERS = KOCH-ROACHES ON THE RUN... CO-Operacy-IN-ACTION INITIATIVES & GLOBAL-LOCAL-GLOCAL-I-ZATION WILL WIN OUT OR WITHIN ALL FASCISTS...EVERYWHERE!!!!!!!!!!!!!!!!!! 56635 2.6 years ago David Buckle Stellarton, NS , CA Release and support this hero. Kinda late but we must keep trying to charge and incarcerate the alphabet SS of the American elite. When you sign our petition, your name and email address may be provided to one or more of the sponsoring organizations. You may opt out at any time. Sponsored by ExposeFacts, the Freedom of the Press Foundation, the Government Accountability Project (GAP), The Nation, The Progressive / Center for Media and Democracy, Reporters Without Borders, and RootsAction.org. We have removed all duplicate signers.